The opposition Movement for Democratic Change has called upon its members to engage in mass action in 2019 and to be courageous enough to die in defense of MDC leader Nelson Chamisa. The call was made by the radical MDC Deputy Treasurer General Charlton Hwende on Monday. "2019 is the year of rolling mass action against the illegal regime of Emmerson Mnangagwa." Hwende said. "We voted for Nelson Chamisa and we must be prepared like the thousands of gallant Liberation struggle heroes to die defending our right to chose the President of our Choice." 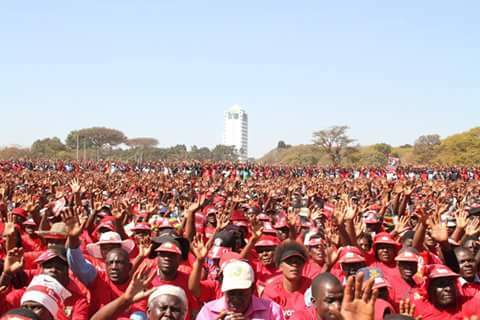 MDC has always been accused of having a violent wing of their Yoth Assembly called the Vanguard but Chamisa claimed to have dissolved the structure. Hwende further insisted that Chamisa won the elections and the results are available at the Zimbabwe Electoral Commission servers. "We must stop Election manipulation. Some few people voted for Mnangagwa we accept that but the results on ZEC Server clearly shows that Chamisa won the Presidential Elections." MDC has been calling for President Mnangagwa to come for dialogue but ZANU PF Secretary for legal affairs Paul Mangwana has insisted that ZANU PF will only talk to MDC when Chamisa comes knocking at the door. "The big brother will not go to the younger brother. It is the other way round. We have always been open. We will talk to Zimbabweans who think they have something to offer. We are open, but we will not accost them to talk," Mangwana said.